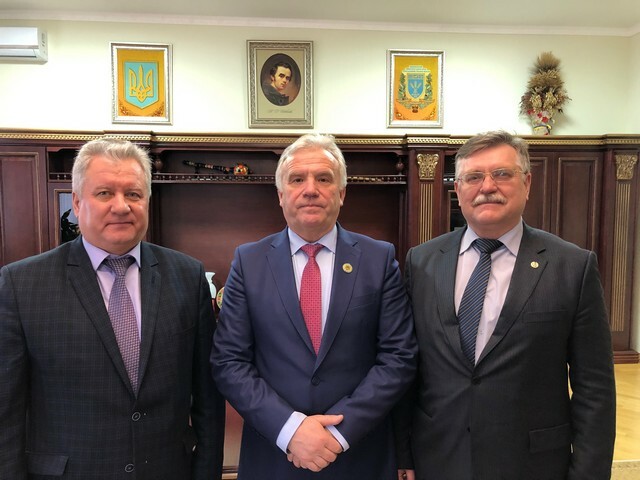 On January 31, 2019, the Minister of Education of Moldova in 2005-2008, Secretary General of the Organization of Black Sea Economic Cooperation, Doctor of Psychological and Pedagogical Sciences, Viktor Tsvirkun, visited the National University of Life and Environmental Sciences of Ukraine. During the meeting with Rector Stanislav Nikolayenko, Viktor Tsvirkun dwelled on the situation in the educational field of his country, Eastern Europe in general and outlined the development trends for the nearest future. Head of NUBiP of Ukraine acquainted the guest with the educational and scientific facilities of the university, restored after the fire in University Building 3, the university history museum, campus structure, etc. Stanislav Nikolayenko and Viktor Tsvirkun agreed to further develop cooperation between the countries, as well as between NUBiP of Ukraine and Ion Creangă State Pedagogical University of Chisinau in education and scientific fields.